Findlay Customs hits News Stands! Las Vegas Review Journal Findlay Customs hits News Stands! You might say that Findlay Customs General Manager Mike Austin has one of the best jobs in Findlay Automotive Group. While the chain’s long line of dealerships count on Findlay Customs to provide various services and products such as window tint, clear bra protection, custom stereos, spray and bed liners, custom fabrication and exotic paint jobs, the bulk of the activity in the Valley Automall shop consists of customizing new cars, classic cars, boats, ATVs and hot rods. If there is any problem with the location at 7725 Commercial Way, it may be that it’s outgrowing the current building. 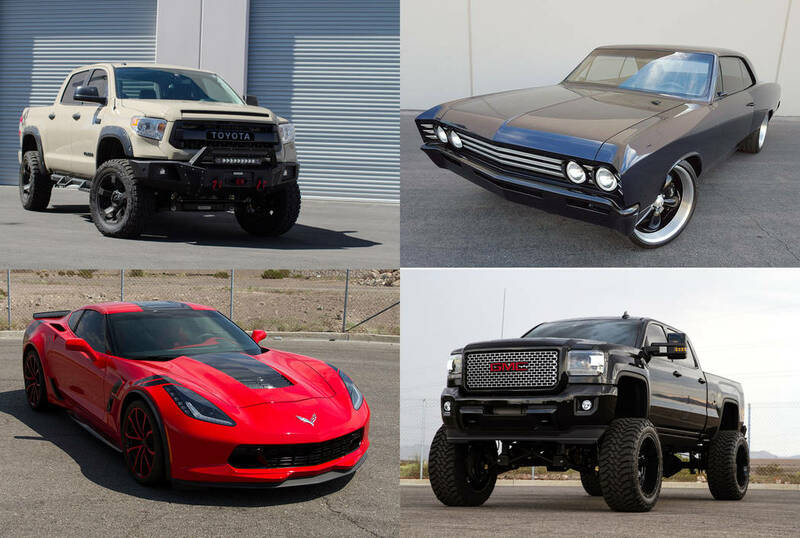 Customizing vehicles has grown dramatically in the past few years and so has the workload at Findlay Customs. “You never know who’s going to walk through our doors,” said Austin, who has been with Findlay Automotive Group for almost 15 years. “We work on pretty much anything. If you can dream it, we can build it. Findlay Customs is co-owned by Findlay Automotive Group executive Robby Findlay, who was instrumental in bringing Findlay Customs to the Valley Automall in 2004. Work is also performed by Findlay Customs in Arizona stores situated in Prescott and Flagstaff. When the economy tanked about eight years ago, Findlay Customs’ workforce buckled down and weathered the storm. For more information about Findlay Customs services or to see some of its projects, go to www.FindlayCustoms.com or call 702-869-0444. Findlay Automotive Group was founded in 1961 by the late Pete Findlay, whose son, Cliff, now oversees operation of 31 dealerships in Nevada, Utah, Arizona, Oregon and Idaho. Social Networks – Give us a follow!